By the turn of the 20th century, City Island, New York had become a major center for wooden boat building with a worldwide reputation for the highest quality. To celebrate this remarkable achievement, the City Island Nautical Museum has mounted an exhibition of photographs and commentary on the extraordinary period in City Island’s history when yacht and shipbuilding were at their peak. 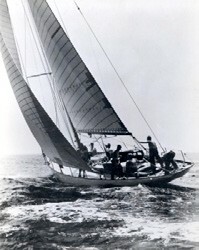 Commissioned by tobacco heir R. J. Reynolds, the Sparkman & Stephens sloop Blitzen was built by Henry B. Nevins Incorporated in City Island, NY in 1937. Curated by trustee Barbara Harrison, the exhibition will be on view through December 20, 2015, and from March through June 2016. Featured are all the old yards, the brilliant craftsmen who worked there, the methods of construction they used, and the famous sailing and motor yachts they produced. Also highlighted are the military vessels that were built during the war years and the 12 Metre sloops that successfully defended the America’s Cup seven times. The City Island Nautical Museum is located in a former school building, now a landmark, at 190 Fordham Street. There is no admission charge, but donations are gratefully accepted. The museum is operated by the City Island Historical Society, a non-profit organization chartered by the State of New York’s Department of Education. Regular hours are Saturday and Sunday from 1 to 5 pm. Special tours available by appointment. For more information and directions, visit cityislandmuseum.org.